It's a sad truth, but the average living room isn't suited to sub-bass. Room modes (aka standing waves) can create havoc with the lower frequencies, and can contribute to a response that is often far from smooth. 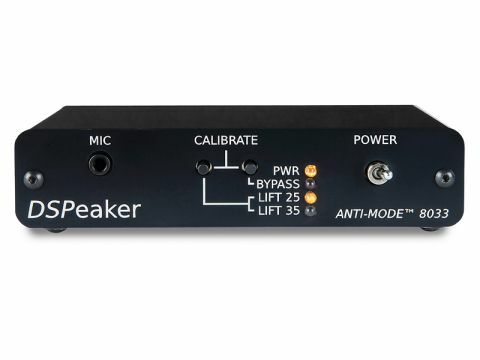 However, insert the DSpeaker Anti-Mode 8033 between the amp's LFE output and your sub's line-level input, calibrate the listening area with the supplied mic, and a series of test tones will allow the 8033 to analyse the response and apply correction, so that the overall LFE response is as flat as possible. It works exceptionally well and makes those lower octaves firmer, smoother and better-defined. Reduces boominess, rendering explosive movie soundtracks cleaner. The Anti-Mode 8033 works across the 16Hz – 144Hz range. Inside the device, a battery of 24 anti-mode filters (with a resolution of 0.5dB) have been implemented in DSP. Despite such internal sophistication, it's easy to install and use. Handily, a bypass switch lets you switch the 8033 out of circuit, and judge the benefits of its processing for yourself. Two outputs are provided, one of which is out of phase with the other. We would have liked the ability to download the original and corrected LFE response-curve data, via a USB port, so we can quantify the effects. Another slight design flaw is the phono sockets are partly recessed, making it difficult to fully insert some varieties of plug (such as the ones QED fits to its Qunex cables). Also worth mentioning is that all of the processing (the signal is converted to digital and treated by DSP before going back to analogue) introduces a delay of milliseconds.